After shining with the bat, the Indian spinners ran through the England batting order, overcoming Joe Root and Haseeb Hameed's patient knocks, in their 2nd innings at Mohali. A half-century from Parthiv Patel helped India attain the target of 103 quickly and strengthen their grip on the series. Brief Scores: India 417 and 104/2 (Parthiv Patel 67*; Woakes 1/16) won against England 283 and 235 all out (Joe Root 78, Haseeb Hameed 59*; Ashwin 81/3) by 8 wickets. After ending the day 3 in a commanding position with the visitors at 78/4, the Indian spinners did not waste much time with Jadeja removing nightwatchman Gareth Batty in the second over of the day for a duck. Ravindra Jadeja pitched the ball straight for Gareth Batty who tried to play it with a straight bat, but was trapped plumb in front of the wicket, and India tightened their screws from there on. With the pitch now completely aiding the spinners, there was no sight of Mohammad Shami or Umesh Yadav warming up in the first hour of the day. At the other end, Joe Root tried to stage a fight-back against all the odds by escaping an lbw appeal and a stumping attempt in Jadeja's bowling to reach his half-century in 147 balls. 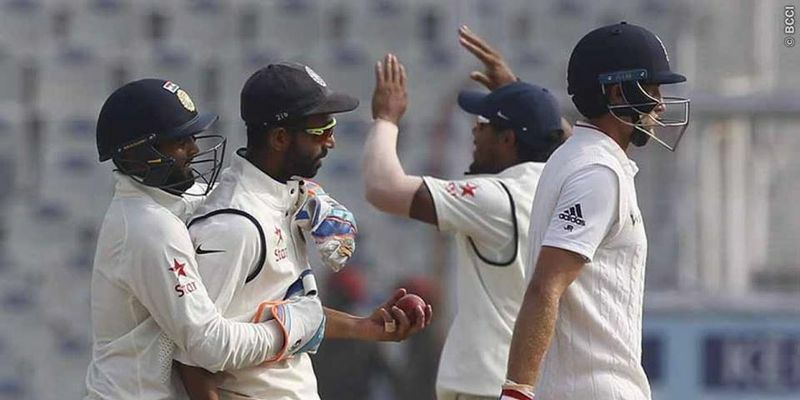 But India piled on the pressure at the other end, when Jayant Yadav removed Jos Buttler with the score reading 107/6. Root seemed to have found a perfect partner when teenager Haseeb Hameed walked in late down the order after injuring his finger on the first day of the match. The pair put on 45 runs in 20 overs for the seventh wicket but Jadeja struck just before the lunch break. The left-armer spun the ball from around the off stump which took an outside edge of Root's bat and was caught by Ajinkya Rahane in the slips. England then went into the lunch break at 156/7 with Chris Woakes and Hameed at the crease. Post lunch, Hameed and Woakes put up a late fightback by navigating the spinners carefully. Noticing this approach from the visitors, Kohli introduced the pacers into the attack after taking the new ball. This had an immediate result for India as Shami removed Woakes and Adil Rashid at the score of 195 and England with a slender lead. Despite all his injury problems, Hameed showed great character to protect last man James Anderson from the Indian bowlers and completing his fifty in the process. After the pair survived 7 overs, Jadeja brought an end to the England innings at 235 runs when Hameed called for a second run after striking the ball deep down the leg side. Jadeja targeted the slower James Anderson with his throw from the deep and Ashwin quickly took the bails off before Anderson could reach the non-striker's end thus setting India a target of 103 runs to win the match. India received a minor hiccup at the start of their 2nd innings with Murali Vijay edging Chris Woakes’ short-pitched delivery to Joe Root in the slips with the score reading 7 for 1. But Cheteshwar Pujara and Parthiv Patel batted at a brisk pace by hitting the England bowlers for boundaries as India walked into the tea break at 33/1 in 6 overs. Parthiv continued his aggressive knock after the tea break. He went after Rashid in the 14th over and hit him for a four and massive six, the first of his career, over mid-on to bring up a brilliant half-century. Although Pujara was dismissed while attempting a sweep, which induced a top edge and reached Root at the short fine leg, Parthiv and Kohli took India home with eight wickets in hand, and extended India's lead in the 5-match series to 2-0.